Our Li'l Pals Bristle Kitten Brush is designed to lift loose hair and debris from your pet's coat while distributing natural oils for a soft, shiny coat. 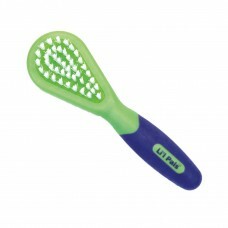 Li'l Pals kitten grooming tools are scaled down to the perfect size for your kitten. Li'l Pals Bristle Kitten Brushes feature quality bristles that create a shiny coat for your small cat or kitten. The Li'l Pals grooming line encourages a stronger bond between the owner and pet.